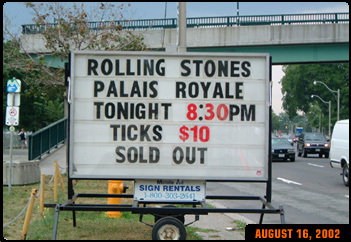 The Rolling Stones performed in front of 1,000 lucky fans and invited guests last night at a surprise gig in the the Palais Royale Ballroom, Toronto, Canada. The band sounded great, as i they played songs such as "Can't You Hear Me Knocking", "Heart of Stone" and their new single "Don't Stop". Keith said "We are rehearsing", as he did "Happy". Not much to tell about how I found out about the gig. I knew since the Press Conference that somehow some way I was going to make this party. Sure as this week begun I was getting a little nervous but by late Tuesday night I was in! The Rock and Roll Gods looked upon me and smiled. There is a lot of stuff between Tuesday and about 1040 on the 16th that I'd love to share but I can't and it would bore some of you anyway, so on with the show. IORR - I must say this is one song I wish they would drop from the setlist, but on this night I'm glad they did not! For me it turned out to be an excellent choice to open this show. It didn't have the same sound or feel as it did when I last heard this on March 16, 1999. The guitars came to life. In fact the first thing I noticed was how well Keith's fingers were moving up and down the frets of the guitar. Then I looked around and I noticed a new keyboard player, Tim Reese was on Piano. Chuck was there too but it was still an added dimension. The TUNE ROCKED, like it should, like it's meant to, unlike the last half dozen or so times I've heard live. Sad Sad Sad - This song kind of quieted the crowd at first. But it was played at a blistering pace which I thought brought most of us back into the fray, singing along. Sad Sad Sad may have lost some of the crowd but only momentarily. Next up was ' If You Can't Rock Me' the entire joint must have been dancing and singing. If my memory serves me this was the first song were I noticed any real trouble. They hit that point were the song needs to change and it wasn't real smooth. They gravitated to Charlie a look here a nod there and bang there off and running. It was a thing of beauty. This is what I come to see. How can anyone get tired of that? Stray Cat Blues - Another crowd favorite But honestly I thought this was the first song that still needed some work. Something was off. Micks lyrics were hard to understand and the song just basically had a bad feel musically. Emotionally I loved it. Hot Stuff - Luke warm with the crowd. The band seemed to be feeling there way through this one. But at about the half way point it turned around. Mick was especially good on this. His moves, his mannerisms, attitude, he was in rare form. I really enjoyed watching him work on that one. Don't Stop - Please Stop! My impression of this is that very little effort went into making it. It might out to be a decent 'POP' song but not a Classic Stones song by any strech of ones imagination. Honky Tonk Women - let's face it's a fun tune. One they don't have to rehearse they played it great. Keith starts it off just picking the strings with one hand. The crowd really enjoys it, it's a keeper. Torn and Frayed - Keith broke out a new guitar just for this one. I believe it may have been an Anderson. It appeared brown with a marble effect from my vantage point. The song worked. But even in this intimate setting I could tell now that there were lots of tourists. Wild Horses - fantastic the guitars, the piano, Mick. This song was just done beautifully. It nearly brought a tear to my eye. Happy - Keith's turn. Happy is/was one of my choices for Keith to bring back this tour. Ron sat and played the pedal steel and Keith played his classic style. He missed a few queue's with the vocals, but hey it's the first night and Keith can do no wrong in my book. But I really really wish Mick could stay on stage and sing back up for this tune. This not because I don't like Keith's singing. It's because I love this particular song with both of them singing it. Can't Turn You Loose - a fun song by Otis Redding, they played it wonderfully the whole band jammed well to this one. Mick pranced all over the stage. The crowd responded well. I'm guessing this will be in the theater sets. Heart of Stone - again Mick shined on this. I think this would be one of those times where Keith would say he reinvented a song. It's a keeper. Can't You Hear Me Knockin' - The most anticipated song of the night for myself and a couple of my neighbors. They truly didn't disappoint. Keith started this song out perfectly.The lyrics the guitars were great. It seemed a tad slower then other versions I've heard but this works! The lead switches to Bobby Keys who is flawless against Charlie's steady back beat. While Bobby's blowing on the pipes Keith and Mick gravitate towards Ronnie, Mick's shaking the Maracas they are all standing just to Charlie's right they become part of the crowd watching Bobby Key's go to work ....... Bobby turns it back over to Keith the transition is near perfect Ronnie steps up next to Keith a step behind him and to his right Ronnie feels his way into the lead slowly at first then gradually picks it up. They got this song almost nailed! I would only ask for the jam to go on a little longer. And I missed Charlies high hat work. This must have set the stage for Jumping Jack Flash - These guys must have been on some kind of high after nearing acing CYHMK and they delivered a powerful JJF. Brown Sugar - was the encore and as soon as it started I headed for the back of the hall. I was completely exhausted. And needed to cool down. Had it been a different song I would have stayed put, but I've heard that one a million times. There are so many little details that as they were happening I wanted to remember so I could talk about them here. But the show just took me away and I couldn't be bothered with thinking about all the little things. It was a fantastic night and a fantastic show! They were very loose, here's for hoping they stay loose the whole tour! The show was amazing. I was in the front row, just to the right of Keith's mic. The setlist is already well known, so here are some observations of the show. The waiting line was very orderly and although it was long, it was fun talking to other fans. I met the famous Stonesdoug, Porter Davis, Greg Clifford and Toronto Tom. All had great StonesStories to share. There was supposedly one guy offering $1000 for a wristband and ticket. From outside, we could hear the band rehearsing what we thought were Tumbling Dice, Don't Stop and Can't You Hear Me Knocking. The press was out in full force. There were tons of professional photographers, camera crews and reporters covering the event. The Stones' have a great security team. Lots of fans pester them, but they are polite and patient with even the most annoying people. From where I was standing, I could see everything that was happening in the wings on Ronnie's side. Jo Wood was looking sharp in a 70's Anita Pallenburg-esque outfit and hat. She watched very closely when Lisa Fischer was dirty dancing with Woody during one number! It was quite amazing to see Elizabeth Jagger gazing at her father like she was a star-struck fan during Stray Cat Blues. She was literally transfixed by him, like a cobra by a snake charmer. She did snap out of it and dance like a wild child later on though. James Jagger was there too and he looks taller than Mick now. Sharon Stone was backstage, being shuttled from one wing to the other and back again before the show began. When the lights went down before the show, the technical crew all started giving each other hand signals saying, "Here we go, this is it". The Stones came out and looked relaxed and ready. The road crew had put a coat hanger with a sign saying "Open" next to Charlie's kit. Even though it was hotter than hell in there, Charlie was wearing a perfectly pressed jacket, as usual. As he took it off to hang it up before sitting down, he got a laugh from the sign. Then they jumped right into IORR (they must have opened with that in honor of Bjornulf!). People make a lot of the Stones looking old. They really have not aged too noticeably since the Steel Wheels tour. It struck me in '89 that they looked like middle aged guys, but since then, they have really held it together. They all are lean, agile and very energetic on stage. Keith is getting a little more help with his hair color this time around. Last time around he went more natural. He only had one or two things hanging out of his hair this time. Mick really looked like he was enjoying himself. I have been right next to the stage at stadium shows from every US tour since Tattoo You, and I always get the feeling that he is conscious of making himself appear bigger than life. I have always thought he looked tight and serious while performing. Last night, he looked relaxed, happy and at home. He was really having fun. Keith always looks like he is having fun on stage. Last night he was smiling most of the time, but he put on his "I'll slit your throat" expression when he was playing some nasty licks during Stray Cat Blues. At times, when the people directly in front of Mick's mic (like Toronto Tom) would be shouting "Keith! ", Keith would put his finger to his mouth and say "Shhhh" and then shoot a look over to Mick as if to say, "Let him think he's the star". It was funny. Woody was really focused on playing. He looked like he was really enjoying himself in spite of the fact that he was only drinking some blue Gatorade-looking drink (the roadies took the labels off of all of the bottles on stage- you probably need to pay if you want a product placement on the Stones stage). He had his work cut out for him, playing pedal steel, slide AND trying to play the Mick Taylor part of Can't You Hear Me Knocking, but he was up for it. I gained a new level of respect for his playing last night. I couldn't see Charlie's expression for the whole night because his cymbal was in the way, but he sounded like he was having fun! It appeared like Mick and Keith were getting along well. At past shows, I have always noticed that they almost avoid eachother on stage. Last night they were really communicating during songs with winks and nods, and they were congratulating eachother between songs. There were only one or two times when Mick nodded to Keith to end a song and Keith kept going, but Mick ad-libbed and didn't get bitchy about it. After Happy, Mick came out with a dry towel and handed it to Keith, who was dripping sweat. They really looked like friends then. After one of Bobby Key's solos, Keith went over to him and gave him a little kiss. Then he kissed Lisa and since Daryl felt left out, he blew him a kiss too. Mick spent a lot of time working things out with the technical guys during songs. At one point during CYHMK, he was directing them like a conductor in front of an orchestra. The sound was great from where I was standing. I was very close the biggest speakers in the place, and my ears were barely ringing after the show. Just as they hit the opening notes to CYHMK, Keith's guitar tech, Pierre and the other technical guys started giving eachother high fives. During the break, before the encore, Charlie went down and hung out with the technical guys. I had driven to Toronto the week previously for one night to hear the rehearsals. I was in my glory because they played one of my top 5 favorite songs that night, Sway (along with a blinding version of Love Train!). Last night, it got even better because they played another of my top 5, Torn and Frayed. Mick announced that they had never done it before, but they did it in Vancouver in 1972. They did a great job on it, even though Keith can't hit the high harmony like he did when they recorded the studio version. Mick got angry with himself when he was playing his acoustic on this one, he was standing right in front of me and he said something like "What am I doing? I am useless!" Keith expressions and body language really acknowledged that the lyrics Mick was singing hit close to home. I hope this stays in the set list because real fans will love it. I Can't Turn You Loose was so much fun! 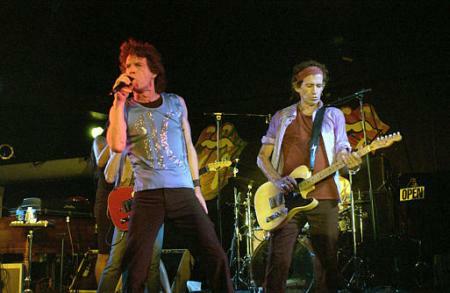 I have always thought of the Stones as the ultimate cover band. In the old days, their covers were usually better than the originals. I really hadn't liked the covers they had tried for the last 15 years though (Harlem Shuffle, Can't Get Next to You, Like A Rolling Stone [sorry]). This was a great song for them to cover, and they nailed it. Love Train was amazing in the rehearsals, so maybe that will end up in the set list some time too. One thing that struck was that I was seeing the Stones in a tiny club with 1000 people and it all seemed so intimate. 40 years ago, when they first started, playing for that many people would have probably scared them to death. It seems right that they are transitioning back to playing smaller venues in a graceful way. Hopefully, after this tour they will quit playing stadiums altogether. For me, the show was an experience of a lifetime. I got my ticket through the RollingStones.com site, and it is the first time that I have ever seen the band purposely set something up to reward their diehard fans. I really thank them for that and I hope that they have more things like this planned during the tour, so that other fans can have an experience like I did. All in all, there were some mistakes that they are going to fix, but I wish they wouldn't. Last night was the way to see them- rough and ready. Please send your reports, reviews and comments to IORR! This page will be updated as more reports arrive. Please use the refresh/update/reload button on your browser to see the latest updates if you visit this page often. For personal reports from the show see Shidoobee with Stonesdoug. For details and great photos from the Rolling Stones and their World Tour get IORR 45 due out in September 2002!